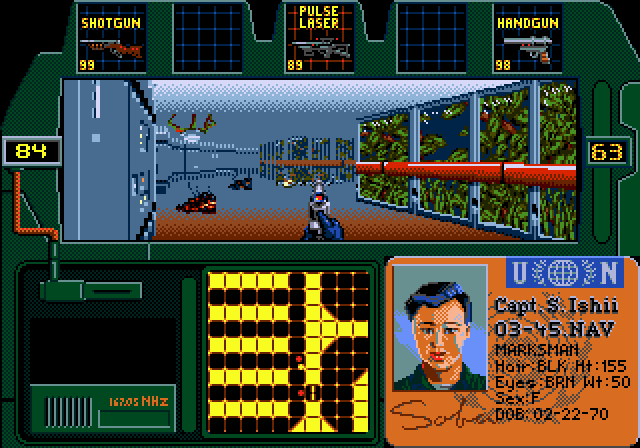 Consoles were never known for their astounding library of first person shooters. In fact, the only one I can particularly remember (skipping over the Doom and Wolfenstein ports) was Faceball 2000. And of course, this game – the shining example of how to do a console FPS justice. Not only does it offer an engine as smooth as its PC counterparts, it also offers a number of elements fairly original for its time. It resulted in a game worth playing no matter what system it was on, and the fact that it was the Genesis just made it all the more noteworthy. As was required by FPS law, the game’s plot is spartan. Aliens have invaded a space station of the Planet Defense Corps, and a squad of the best soldiers government dollars can buy is sent up to systematically secure each and every level. Hence the Zero Tolerance of the name. The levels are connected by elevator or stairwells, and though you can skip ahead, you won’t receive a new save password until you completely clean the levels in order, starting at the top and working your way down. You’ll progress through a small variety of level types, mostly qualified as either “greenhouse,” “engineering,” or “reactor” levels, though each with a different layout and set of textures. After a final boss fight, I felt like I had completed a full game and thought the show was over, but no! After securing the station, you still have the rooftop and high-rise floors of an Earth office building, and a couple of maze-like basement levels to go. This adds up to about 22 levels; not that great, but I remember being astounded by this at the time. Perhaps it was because no one really expected a solid FPS on the 16-bit consoles (or those developers who knew it was feasible weren’t harping that fact). I really didn’t think it was possible to fit what seemed like a whole sequel to the game in the same cart, even considering it was one those special extend-o carts the Genesis liked to bust out for its most full-featured titles. Whatever the reason, the result was clear enough – the “Congratulations, but while you were away…” screen blew me away, and made me think I’d stumbled upon the best deal in Genesis history. What makes it even better are that the office levels are completely different than those in space, and look astounding. The game actually gets better as you progress. 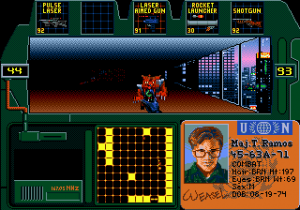 The entire game is played by creeping around through the levels and searching for enemies. The number remaining on each particular level is helpfully tracked on the left of the screen. A radar display at the bottom both assists you in finding your way, and in tracking the movements of any alerted baddies. Along the top of the screen is an inventory bar, tracking the weapons you have amassed up to that point, as well as any specific items like bulletproof vests or fire extinguishers. The latter will be required for clearing a path through blazes that have broken out on particular levels. You only have five slots, so you must burn up ammo for one weapon, or wait until an item’s charge depletes, before you can pick up a new one. You play as one of five operatives, selectable at the beginning of the game and at their unfortunate death. This essentially gives you five lives with which to beat the game, but also provides some variety in the characters you can play as. Each character has a specialty described in their bio on the selection screen. These can be summarized by their roles – medic, marksman, surveillance, etc, and they actually have bearing on the game itself. Most obvious is the equipment each soldier starts with, so the demolitions guy will have mines, and the surveillance guy will start with a scanner to reveal the positions of motionless enemies. Aside from this, their attributes in the game are also tweaked. The medic gets a larger health boost from all medkits, the scout moves faster and does extreme hand to hand damage (a good choice if you’re always running out of ammo), and the marksman can hit enemies at a greater range than the others. The only drawback is that you cannot switch between them at will, so you’ll have to make a decision at the beginning about which character most fits your playstyle, then sort through “the leftovers” if your favorite operative should die. Enemies are a strange and varied group. The human designs look pretty decent, and are made up of soldiers, mercenaries, and the like. The alien designs are more creative, but from the wackier, kiddie area of creativity. There’s a giant man-brain looking deal, an alien dog, and a crab thing with two eye stalks that looks like a Muppet. They’re ferocious enough in terms of damage they can cause, but don’t really look the part. As an added bonus though, all enemies get flung backward from the discharge of your weapon, and scatter small streams of blood around as they fly. The spraying blood is harder to see than in most other similar games, so it’s not QUITE as gory, but you’ll still get puddles of blood on the floor after a battle, or gooey drips on the wall, Duke Nukem style. Your weapons are fairly varied and satisfying to use. Most enemies have a standard weapon like a handgun you can pick up ammo for off of their defeated bodies. The rest can be found in pickup icons scattered around the level. All enemies drop in one hit regardless of the weapon or the attributes of its user, so a handgun isn’t functionally much different from a shotgun. However, when enemies come swarming at you in groups of ten or more, as they are wont to do in the later levels, the benefits of each weapon become clear. The laser aimed gun has a rip-roarin’ autofire feature that’s great for clearing such groups. The shotgun can take out pairs of close-proximity foes with one blast. The pulse laser does well on distance work. The rocket launcher is the only weapon that can take out rooftop snipers, and is great for bosses. And the flamethrower… well, let’s just say you can never have enough ammo for that delightful friend. Some quiet stalking themes play throughout the levels, and these work well. They’re not the frenetic action beats of Doom, but they support the game unobtrusively, and don’t overpower the useful sounds of enemies and alerts. There are some great gun noises, and these are the highlights of the show. The rest, like enemy activation noises and your punches and kicks, don’t quite make it clear what they’re supposed to sound like. You’ll identify enemies by the sound they make easily enough, you just won’t really know what the sound is or why they’re making it. Some digital voices appear as fluff, and announce when you’ve secured a level or picked up a new weapon in a calm, female, slightly British voice. I call her Miss Stevens for absolutely no reason. The engine scrolls just as smoothly and moves just as quickly as one on the PC of the time. The tradeoff for this is an extremely limited, “letterboxed” widescreen view. It will only bother you if you let it, and it certainly doesn’t hinder your playing of the game. If fullscreen was an option, I’d certainly demand it, but as this is the only way to play, it’s still perfectly functional. The graphics are surprisingly impressive as well, with great texture work and detail for the Genesis. Each level type is completely distinct from the others, and the station/office levels share no textures among each other at all. The office levels do tend to be a little bland and open, and the basement mazes are some of the worst in the game, but the overall look is still impressive enough. The engine has a habit of quickly fading to darkness at only moderate distances, and interlacing all textures more than four feet away from you (to save on the drawing load), but they still lend to a nice mood despite these limitations. The appeal of a legitimate Genesis-only FPS will be harder to justify now than it was back then. Even then, if you had a PC, it would still be a little hard to justify. I remember it fondly for the hours of time wasted playing it on the Nomad, and in that sense it became a solid little jewel of a title. If you like and still play Genesis games (and hopefully you do, since you’re here) then this one is certainly worth checking out. You’ll be likely to play it through to the conclusion it deserves. If you can play it on a portable method of your own, so much the better. Otherwise, a neat little piece of history, but nothing so groundbreaking in story or gameplay as to make it a not-to-be-missed attraction. Impressive console FPS. Great variety in the “missions” you’ll undertake, and levels do a great job of suggesting a seamless world. Limited view and limited sight distance. Some goofy alien designs along the way. 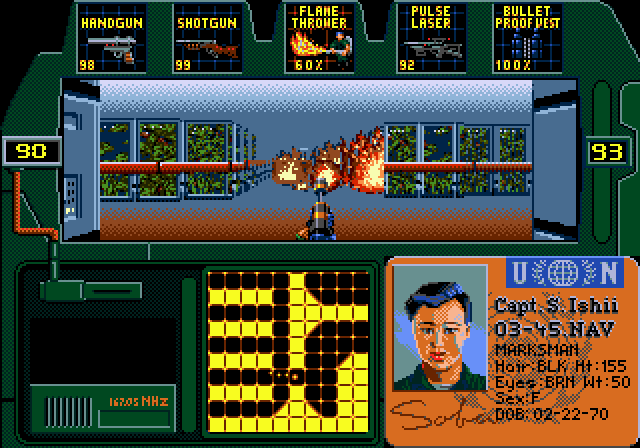 Actually sounds like an improved version of Corridor 7 in terms of clearing floor after floor of enemy aliens. The fire extinguisher also reminds me of the similar feature in the DOS shooter Terminal Terror. The operatives system sounds like nothing ever seen until much later shooters, so paint me intrigued. 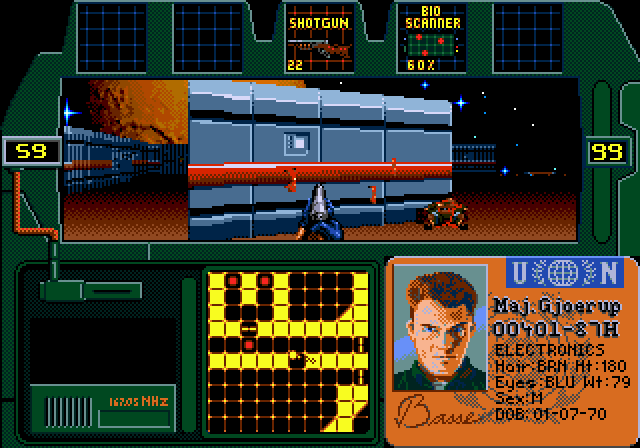 And of course, the gore sounds like something one could only get on the Genesis (well, in console-land that is). I certainly have to try and get ahold of this for my Genesis! Terminal Terror the GCS shooter? I’ve actually been trying to scoop all of the games made on that engine up, and entertaining the idea of reviewing them all. I used to have the GCS, and though making my own games fell apart because I was rubbish at artwork, I still loved the concept. Missed out on the advanced Windows version of the engine too, and kicking myself for that. 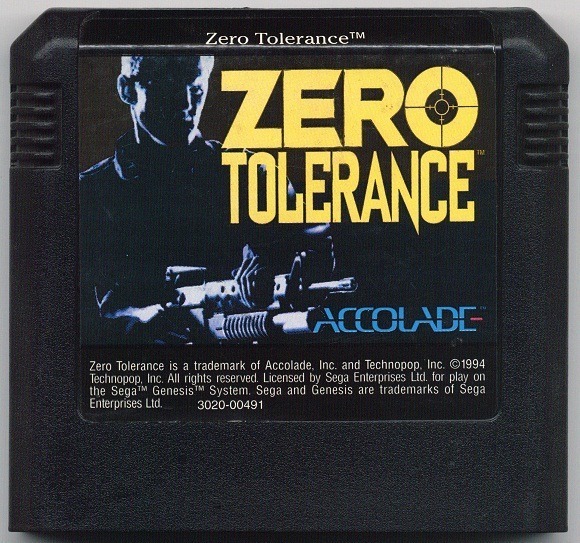 Anyway, yes, Zero Tolerance is a fine game. Owned it back in the 90s and loved it then too. Save a rocket for the sniper on the HQ rooftop! The call goes out to the two vigilante legends that locked those bastards away in 1/2 Star Prison: The J Man (a cross between Duke Nukem’s macho charisma, Doom Guy’s toughness, and Caleb from Blood’s thirst for campy mayhem) and Uncle Dave (equal parts Max from Sam and Max’s insanity, Mike LeRoi’s love of big words and long-winded storytelling, and King Hippo from Punch-Out’s body type)! Select your hero and set out fighting your way through 1/2 Star Prison, with bosses like Steven Tyler from Revolution X, Duke Davis from Bad Street Brawler, both Dr. Jekyll AND Mr. Hyde, until you battle final boss WALDO HIMSELF. 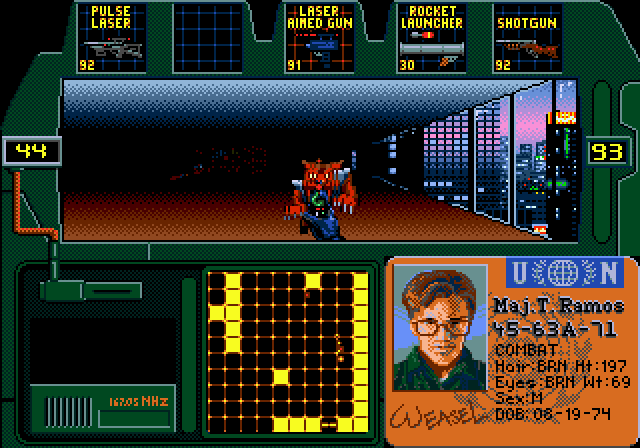 Utilize each hero’s special powers, like J Man’s primary weapon, a machine gun with unlimited ammo but a “gunpower” meter like T2: The Arcade Game, and his Mega Move, NES Logic, where he launches a steady stream of otherwise unthreatening animals or objects that inflicts maximum damage! Uncle Dave comes with the RCP-90 with limited ammo, and the Mega Move of Oriole Fan Rage, making him immune to emotional damage and channeling his frustration into hyper-powered melee damage with an empty bottle of gin! J. G. R.: Just Games…RETRIBUTION. Kids, this is why I brought him on! Jeez, you too? And I thought I was alone when I started working on this in 2010 when I wrote the Wikipedia article. This actually grabbed the notice of Kevin Stokes, who came to the then-forum of my little programmer group to thank me. At the time he was trying to rebirth Pie in the Sky Software as an Android shop, having made a dice physics simulator, but sadly he has not done much on this since. I myself have also been building a collection as part of my prior mentioned quest. The guys there are themselves still fiddling around with the old DOS GCS, the main guy trying to make the fanciest showcase he can via the MOD-G project, and the collector supposedly planning something of his own as well. Of course, I too can not really think of a hook for a JGR-themed FPS, well, other than having it be a mish-mash of retro game graphics but that is a bit too obvious and, if that bothers, too copyright bending. Of course I myself got my start toying around with making shooters in Game Maker, which, it has to be said often has had games just as terrible as were made by the GCS. That is the thing about amateur work – it is wonderful that people can get enjoyment from making their own thing, even if in the end it is not very good. Still, there are a few more inspired GCS titles – I was quite impressed by Continuum, for example, in how it used some of Pie 3D’s more forward thinking plot elements like written notes, scripted sequences and friendly NPCs. I do still wonder what Stokes would have come up with had he kept at making his own games, rather than simply going through the nightmare that was supporting his tool, as I think he deserves mention alongside Carmack and Silverman in terms of 1990s 2.5D engine programming. You know, you are making it hard for me to suggest obscure shooters to you when you already know them all! This requires my full attention once the Halloween reviews are out! I do remember Pie in the Sky selling art packs that I never had the money for. Looks like others didn’t either – I agree it’s almost always the same HUD and Ninja Kick 😛 Not many seemed to go for the Goo Gun though. This is great! Next, you’re gonna tell me you played Aliens Online too! It is actually good that Stokes infused the original Pie 3D games with so much zaniness, as otherwise the repetitions in all the GCS made games would be even more trying – but there is something always nice about the Ninja Kick! Hiya! Now that I am done Bad Toys 3D I am going to have to decide whether to continue by Blake Stone game or finish Terminal Terror (and then maybe give Lethal Tender a go).